Looking for new creative activities to do with your preschooler? Science experiments are one of the best ways for your child to learn while having fun. You and your child can explore scientific breakthroughs by using a few products found around the house. These 5 science experiments are sure to be a hit with your preschooler. Go and grab a few household materials to try out this awesome science experiment. Your child will love exploring how colored watered and oil work together. 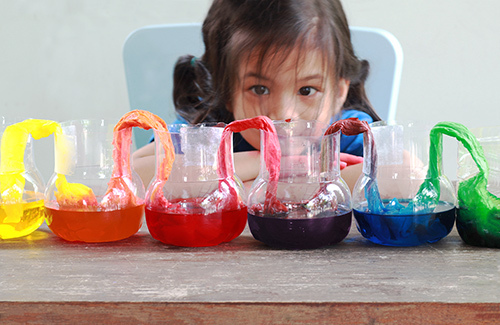 Making a rain cloud in a jar is a fun and exciting way to teach your preschooler how it rains. This is a perfect at-home activity that you and your child can enjoy together. This color changing flower experiment is a crowd favorite. It is a fun and easy science experiment to do with your preschooler. They will love watching their flowers turn beautiful colors. What child doesn’t want to be able to build their very own rainbow? With just a few household items your little scientist will enjoy watching an empty jar transform into a full rainbow. The magic milk experiment is a terrific activity to try with your preschooler. This experiment makes super cool color explosions, leaving your child wanting to do it over and over again. Preschoolers learn and develop through hands-on activities that promote creativity. At Primary Beginnings Child Development Centers, we value early childhood learning through fun stimulating activities. Contact our North Hills or Spring Forest location in Raleigh to schedule a tour and learn more about our curriculum program.